Kassel JC, King D, Spurling GK. 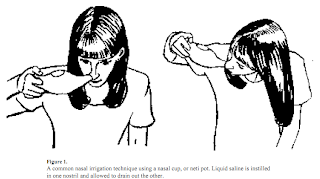 Saline nasal irrigation for acute upperrespiratory tract infections. Cochrane Database Syst Rev. 2010 Mar17;(3):CD006821. Review. PubMed PMID: 20238351. Shaikh N, Wald ER, Pi M. Decongestants, antihistamines and nasal irrigationfor acute sinusitis in children. Cochrane Database Syst Rev. 2010 Dec8;(12):CD007909. Review. PubMed PMID: 21154389. 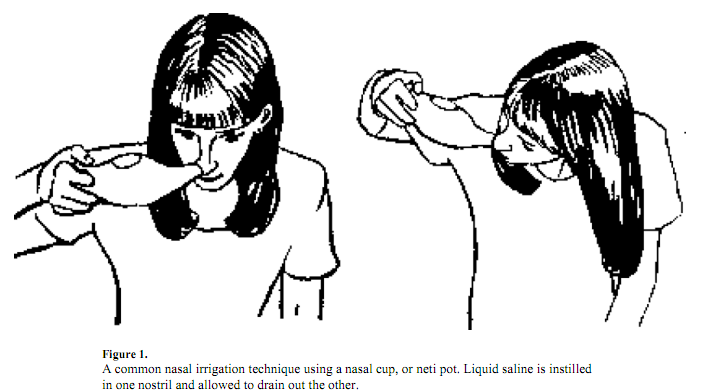 Rabago D, Zgierska A. Saline nasal irrigation for upper respiratoryconditions. Am Fam Physician. 2009 Nov 15;80(10):1117-9. Review. PubMed PMID:19904896; PubMed Central PMCID: PMC2778074.